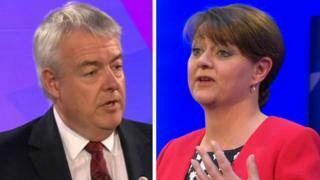 Labour and Plaid Cymru will hold a formal meeting on Friday in a bid to break the deadlock over who should be the next first minister. It is understood talks will take place between senior party figures but not leaders. The discussions will come two days after a dramatic Senedd tie for first minister. Lib Dem Kirsty Williams backed Labour's Carwyn Jones while the Tories and UKIP joined Plaid in voting for Leanne Wood. Meanwhile UKIP AM Nathan Gill has said he is prepared to back Carwyn Jones's re-election as first minister if some of his party's manifesto can become law. Informal discussions continued on Thursday, but on Friday Labour and Plaid will meet formally. Labour AM Vaughan Gething told BBC Wales: "We recognise we've got responsibilities to the people of Wales. We think we have a mandate to form a government in Welsh Labour. "We do recognise we're a minority, so we're having conversations - in fact we had conversations today with Plaid Cymru to arrange for talks to take place tomorrow." He rejected suggestions from other parties that Labour had behaved in an "arrogant" manner by pressing ahead with a vote yesterday without securing majority support. "We've never had a majority in this place, and is in each and every other time we put up a candidate for first minister," he said. "It's pretty extraordinary to say there is an arrogance to say the leader of the largest party should be the first minister of Wales." Simon Thomas, Plaid Cymru AM, said: "We are pleased that Labour has approached us in order to find consensus. "[On Friday] we will be entering into formal discussions with the Labour group in order to find a way forward for the governance of Wales over the next five years." Leanne Wood, Plaid Cymru leader, told ITV Wales she had written to Mr Jones to suggest "a way forward". "There are things we want," she said, referring to the party's nine key election pledges, adding that voting reform should also be discussed. Mr Gill has also told BBC Wales he could support the Labour leader. He said: "We would back Carwyn Jones if we could get some of our manifesto into law. We said all along that we would work with any party. We did not rule anybody out. "The first thing we would want to see is the tolls on the Severn Bridges removed." Mr Gill echoed his party colleague Mark Reckless, who said: "All of us would be willing to back Labour and Carwyn if they were to give us sufficient of what we want in our manifesto." A spokesman for UKIP in the assembly confirmed that this was the group's position. Currently, responsibility for the Severn bridge tolls is not devolved, although there have been calls for powers over them to be handed to Cardiff Bay. A Labour group spokesman, prior to Mr Gething's interview, said: "There are no formal talks with any parties currently and certainly not UKIP." Earlier Plaid's Mr Thomas told the BBC's Daily Politics programme: "I'd be amazed after what the Labour party said yesterday that they'd be prepared to do a deal with an individual UKIP member like Nathan Gill. "It just shows the level of desperation that the Labour party are potentially in at the moment." Earlier, he told BBC Radio Wales that relationships between Plaid and Labour were "not at their best". Labour AM Alun Davies told the station his party had the "right and mandate to govern", but added: "I accept completely that we need to be more open. "We need to be transparent. We need to be inclusive. We have to reach out. That isn't in question." All parties insisted no deals had been done before the vote on first minister. Liberal Democrat AM Kirsty Williams had told BBC's The Wales Report: "I have not done a deal with the Labour Party. My decision was based on the reality of the election result." AMs are expected to meet again next week to vote again for a first minister. They have until 2 June - 28 days after the election - to choose a leader or face the prospect of a fresh election.